We welcome applications from businesses of any size that are professionally engaged in pipe organ building, repairing or tuning. An inspection of work and premises forms part of the application process for business membership. This accreditation process involves the applicant submitting a list of three projects completed during the past five years, and an interview with the applicant may sometimes also be requested. 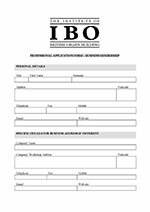 In addition to a listing in the Register of Accredited members, Business members are also permitted to advertise their IBO membership (alongside their accreditation categories) in their publicity and stationery. This is for individuals who are, or have been, professionally engaged in pipe organ building or with its suppliers, and who do not seek inclusion in the Register of Accredited Members. All Professional Membership category fees are reviewed annually with the subscription year running along the academic calendar (September – August).